The Great Irish Famine of 1845-1852 was the defining event in the history of modern Ireland. In proportional terms one of the most lethal famines in global history, the consequences were shocking: at least one million people died, and double that number fled the country within a decade. The Curse of Reason is first and foremost a survey history of this great tragedy. In particular, the testimonies of four key contemporaries are used throughout to convey the immediacy of the unfolding disaster. They are: John MacHale the Catholic Archbishop of Tuam, John Mitchel the radical nationalist, Elizabeth Smith the Scottish-born wife of a Wicklow landlord, and Charles E. Trevelyan the Assistant Secretary to the Treasury. Each brings a unique perspective, influenced by who they were, what they witnessed, and what they stood for. 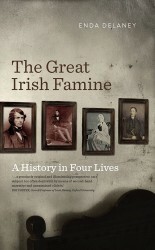 By counter-pointing the progress of the Famine with the experiences of these four individuals, we get an intimate and compelling portrayal of these hungry years. The book shows how misguided policies inspired by slavish adherence to ideology-the curse of reason- contributed to and worsened the effects of a natural disaster of catastrophic proportions. eminently readable... Delaney's approach resists the drive to oversimplify that is an inherent risk of this type of history. Throughout Delaney is very critical of British policy and the behaviour of many landlords and agents, but he is always careful neither to demonize the actors, nor to indulge them. He is also critical of Irish commentators where appropriate... The Curse of Reason is a sophisticated and significant addition to the historiography of the Famine. highly original... gripping narrative... There are many books on these terrible events but this is one of the most fluent and original. Delaney's approach to the story is innovative ... (it will be found) in the hands of those who appreciate first-rate history...a very impressive book.